For some reason, a lot of tailors/seamstresses do this all wrong and try to remove the Sticker Labels by just trying to rip them off. Do Not Do That!! The top of the sticker might come off but the paper will still be on the fabric. Believe it or not, some tailors sometimes leave the stickers on the fabric and sew it just like that. 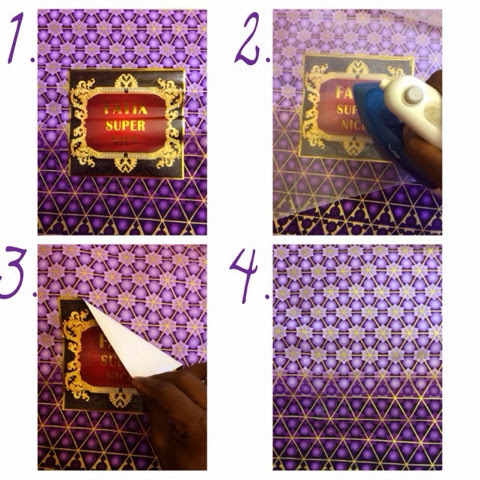 Anyway, here are the very simple steps on how to remove the sticker labels from your fabric. Place a press cloth or paper towel directly on top of the sticker label. Gently press your hot iron on the press cloth so that it can melt the adhesive on the sticker. Peel off the sticker slowly. Viola.. You're Done!! There's really no step 4. Lol Enjoy your beautiful fabric. So helpful! I used to be so upset when my ankara would have stickers. And I've def. seen ladies with pieces of the sticker still intact. Thanks! That's another way of removing it.. But there is always sticky residue left behind…. I can't figure out why they stick the labels on there. You're right.. I don't know why they do that either. They put the labels on as a way to say, this authentic and real, as a way to rep the quality of their brand. Not all wax cutting is the same. People used to print africa cloth and use digital, or low quality machines. The reason their is that stiffness, is that you know real wax was used and with real wax you get the top quality print and the more authentic process. I still have the residue. Can't they just use hang tags. or put the label on the back or along the selvage? Unfortunately I didn't Google this before peeling off the stickers. Now how do I get the residue off? I figured out my own answer (after how many botched fabrics??) -- saturate with WD-40, then scrape, and of course wash afterwards. But next time I'll use the iron first! Still need to get the residue off. Wish not to wash the fabric after a WD40 application. Is there a way to remove the residue without having to wash it out? Place paper towel over the adhesive and then a piece of cloth over the paper towel, the iron it. The adhesive should transfer onto the paper towel. I have the same question. I did this but there is still adhesive left behind. How can you get that off? Thank you for sharing this brilliant idea! It works perfectly every time! You've saved my dresses. Thank you so much.